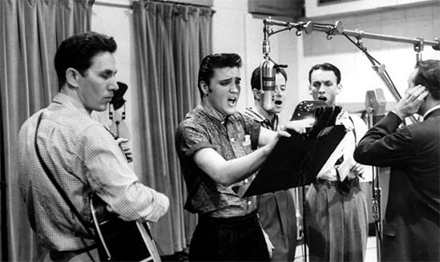 Last year Elvis Presley made $52 million. That’s an increase on the $49 million he made the year before. For a guy who’s been dead thirty years, he makes big bucks. More than any other dead celebrity, in fact, according to Forbes. The Colonel must be spinning with frustration in his grave because that’s a whole lot more money than the King made when he was alive! By the way: Do dead guys pay taxes? 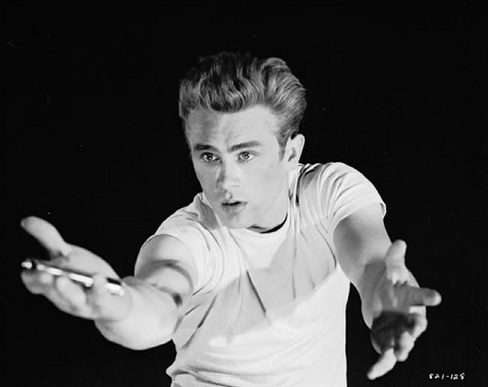 As an aside, the Forbes list reminds me of something that’s been bothering me for a while: Who is it that’s pushing the memory and myth of James Dean? Dean died in the middle 50s at a time when the very earliest boomers would not have been interested in him. What we brought forward into the future was 60s nostalgia, not the 50s. Obviously the punks, gen Xers, and millenials were even further removed from “Giant” and “East of Eden“. So, is it the remainders of my parents’ generation who shell out the $5 million he made in 2007 (53 years after the fatal crash)? I fully understand that images of James Dean stand for alienation and rebellion; and that these emotions and concepts have driven teenagers (especially) in every generation since World War 2 at least. But couldn’t each generation have found their own alienated heroes to cherish and market? How come he has resisted obsolescence? Surely, no-one looking at his three movies today can genuinely suggest his wooden posturings match modern sensibilities. Anyway, good for him and his. I don’t understand the continued charm, but that’s just me. I Didn’t Mean To Do It. It Is A Disease! Charles O’Byrne is the top aide to New York Governor David A. Paterson. He is being forced to resign because he didn’t file his income taxes between 2001 and 2005. His defence? According to his lawyer, Richard Kestenbaum, Mr O’Byrne suffered from “late filing syndrome“. No, I’m serious. They even have an “academic” tome to support them. In 1994, an article titled ” ‘Failure to File’ Syndrome: Legal and Medical Perspectives,” was published in the New York Law Journal by Eliott Silverman, a lawyer, and Dr. Stephen J. Coleman, a practicing psychiatrist. Money can’t buy you love, they say. But it can sure buy you some fancy justifications. I just about never recommend other sites directly. I usually just post links and if you like what you see, you look around. However, Polar Inertia: Journal of Nomadic and Popular Culture may pass you by and I wanted to make a special call out to it. It is a journal of images, often of distressed urban sites. This season’s offerings include a series on tangled utility wires in Bangkok, fascinating shelters built by homeless in Tokyo, and Soviet-era bus stops in the Soviet Union. This is a magazine that covers material I don’t find elsewhere. Well worth a look. I’ve been tracking the contemporary art auctions for clues as to the effect, if any, the financial crisis is having on the luxury art market. The figures from several of the sales this month seem to suggest some slowdown. However, these sales tend to have just a few stellar items along with many lots of more retail-level art. And one’s view of the market can easily become skewed by too little data. On 3rd November, Sothebys in New York is holding an “Impressionist and Modern Art” sale. There are 71 lots and 63 of the lots have estimates of $1 million and above. 24 lots are estimated to fetch more than $5 million. 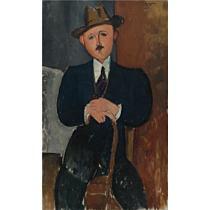 And there is a Modigliani at $25 million (see image) and a Monet at $22m. In addition, there are four other lots — including a Picasso, a Degas and a Munch — that have unpublished estimates. This is an auction for serious collectors and high rollers only. This could be a real test. Back in the 17th century, Biblical scholar James Ussher calculated that God created the earth on October 23, 4004 BC. 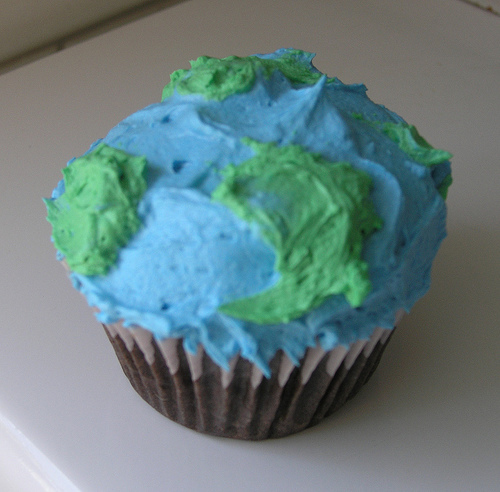 That makes today the earth’s 6,012th birthday! There are of course still some who actually believe the factuality of Ussher’s work. I think some of them ran for US President this year. This rather unattractive, boring even, bra is apparently worth a staggering $6 million. Decorated with 3,900 precious stones, a cluster of tiny black diamonds, 117 one carat round diamonds and 34 rubies, this Victoria’s Secret special is up for sale. As we enter what might well be the deepest and longest global recession most of us alive have ever seen, it is an interesting question whether the hard-pressed masses will be entertained by such excess much further into the future, or whether they will complain about the waste, and perhaps loudly. You are currently browsing the Jak's View of Vancouver v.3 blog archives for October, 2008.